We eat a LOT of nuts at our house. From PB & J’s to trail mix to our favorite peanut noodle salad, it’s hard for me to imagine a life without nuts. 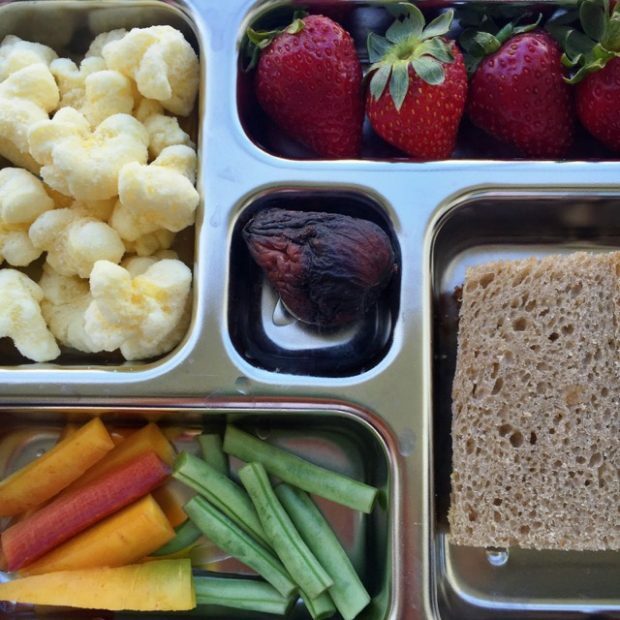 But over the summer, Lucy went to a nut-free camp and I thus had to think beyond my usual lunchbox inclusions. 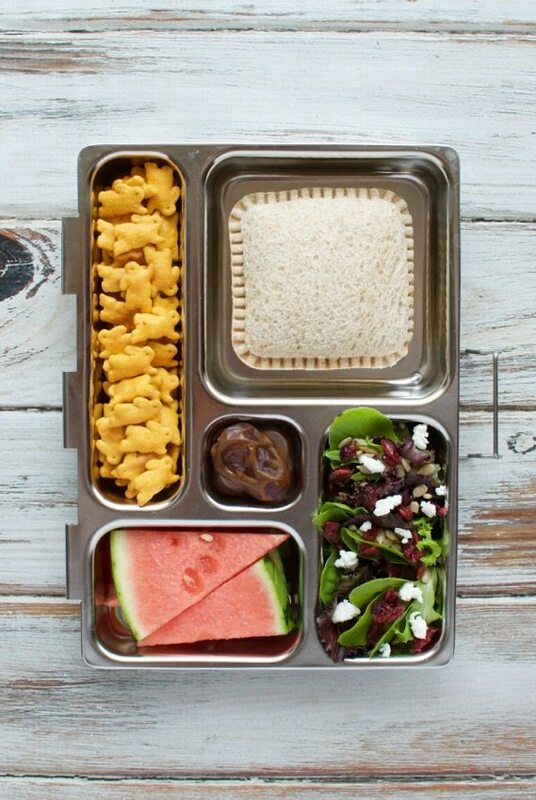 Surprisingly, I found that there are tons of ways to pack balanced, kid-friendly, appealing lunches without nuts. Lucy didn’t even notice and I actually enjoyed breaking out of my regular lunch-packing routine. 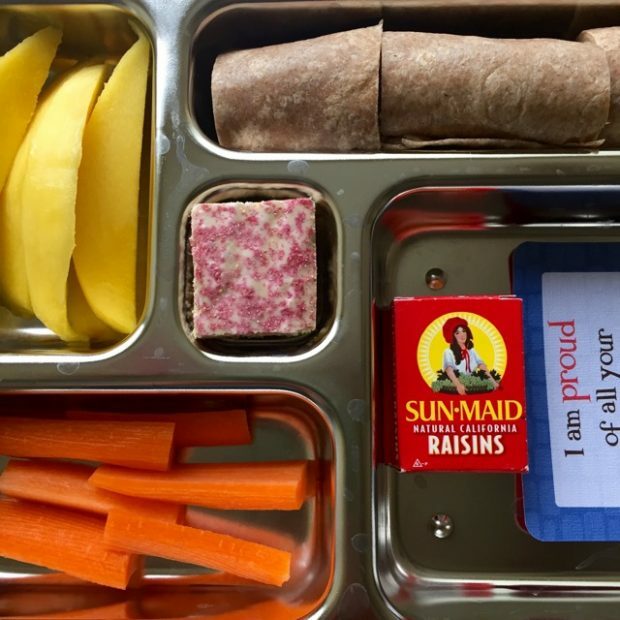 Since nut allergies are common and many schools have adopted nut-free policies, I thought I’d share some of the nut-free lunches I’ve packed for Lucy so we can all continue to expand our nut-free repertoires. 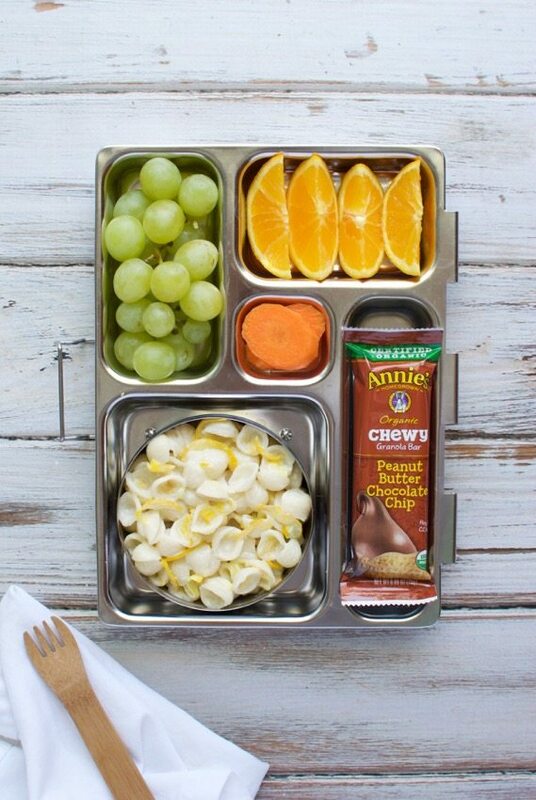 These lunch ideas would also work great for adults with nut allergies or who work among people with nut allergies — just increase the portions slightly and you’ve got a grown up lunch! 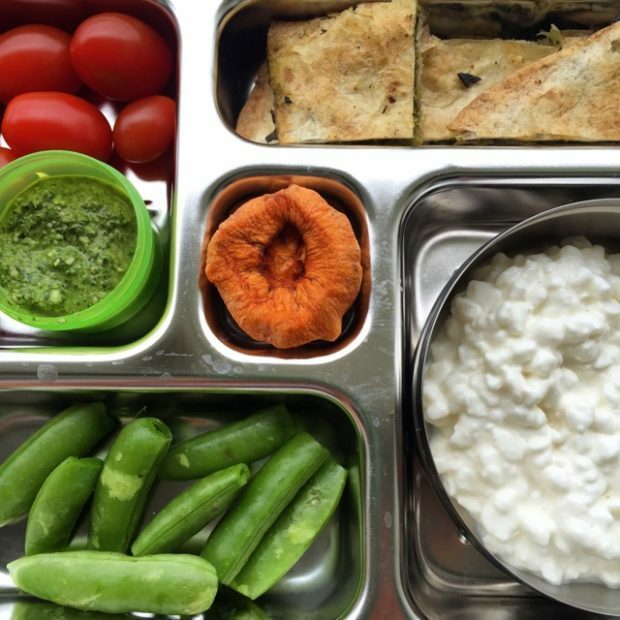 Spinach Bolani (Afghan veggie pancake – available at farmer’s markets and Costco), cottage cheese, snap peas, grape tomatoes with hemp seed pesto, dried persimmon. 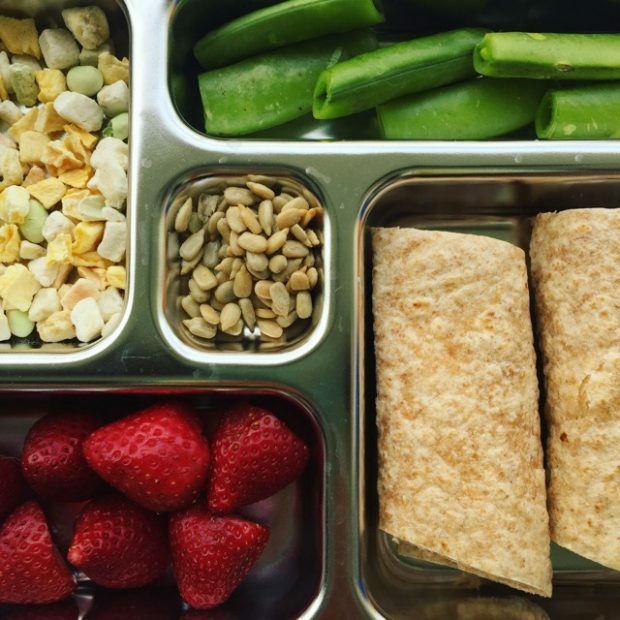 Turkey and hummus wrap, strawberries, Little Duck Organics freeze dried veggies, snap peas, sunflower seeds. 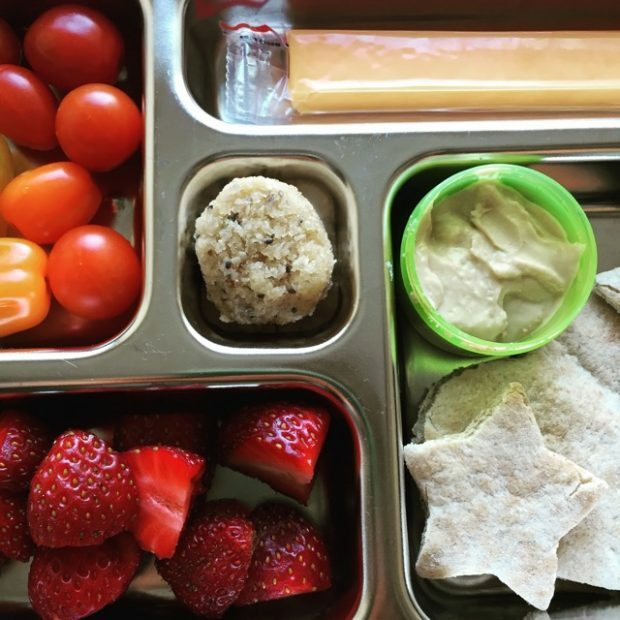 Whole wheat pita shapes with baba ghanoush (eggplant spread), strawberries, baby tomatoes, cheese stick, Nutiva coconut treat. 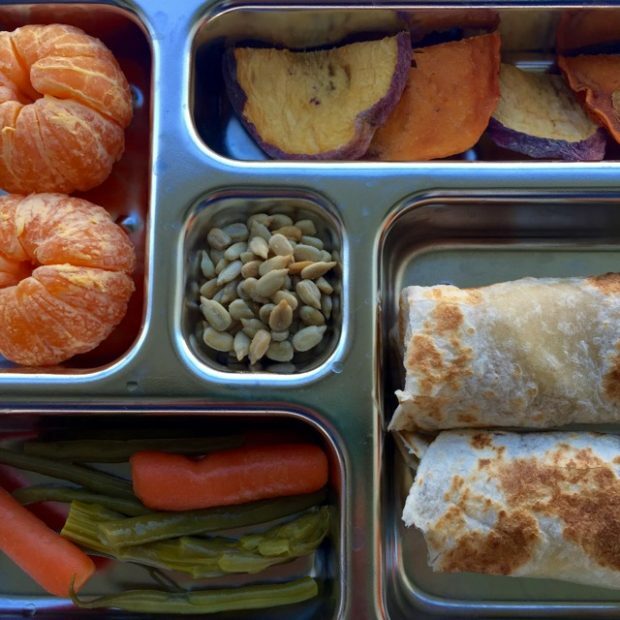 Bean and cheese burrito, pickled veggies, satsumas, dried peach and persimmon slices, sunflower seeds. Avocado sandwich, green beans and carrots, Pirate’s Booty, strawberries and dried fig. 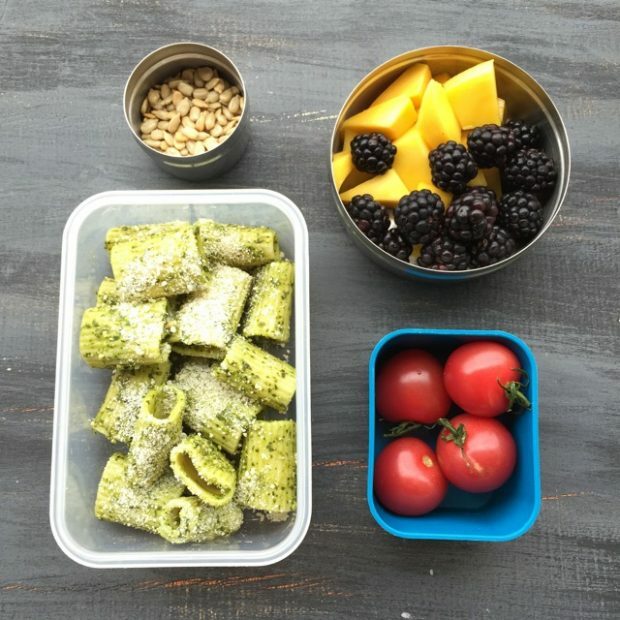 Pasta with nut-free pesto, sunflower seeds, blackberries and mango, cherry tomatoes. 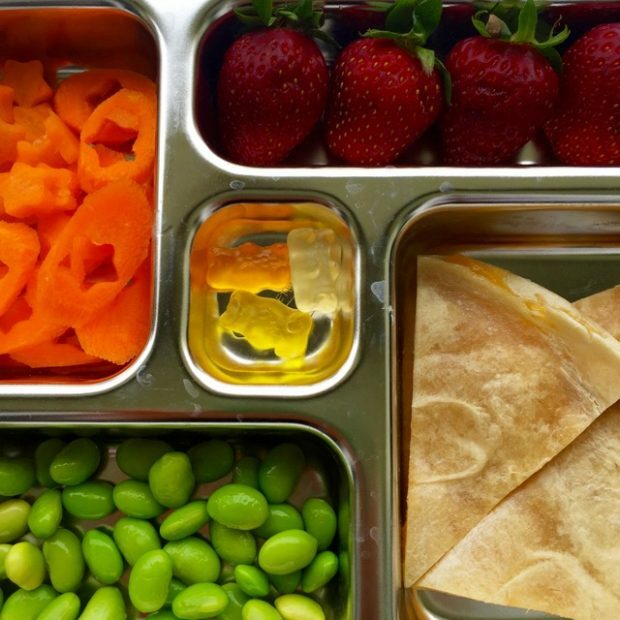 Cheese quesadilla, edamame, carrot shapes, strawberries, dye-free gummy bears. 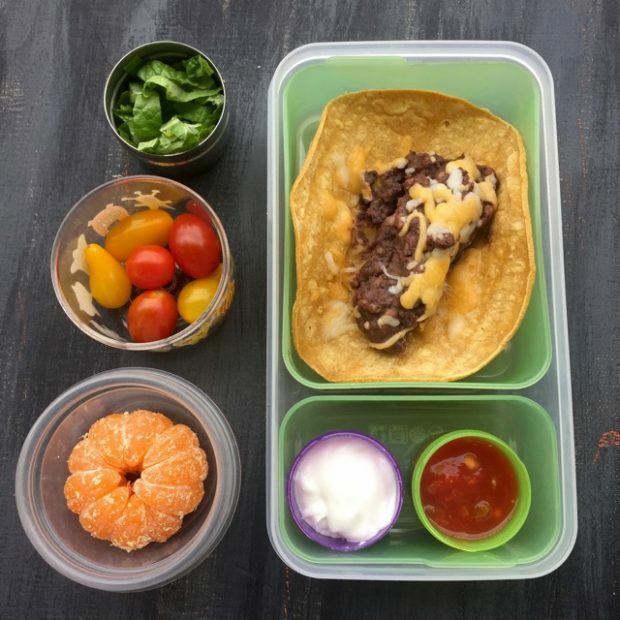 Bean and cheese taco with salsa, Greek yogurt & lettuce, satsumas, cherry tomatoes. Ham and cheese wrap, raisins, carrot sticks, mango slices and piece of dye-free frosted sugar cookie. 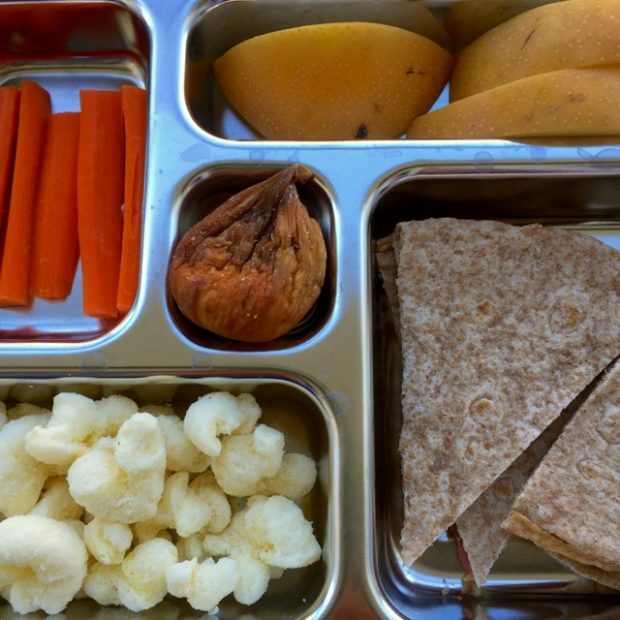 Hummus and olive quesadilla, Pirate’s Booty, carrot sticks, Asian pear slices, dried fig. 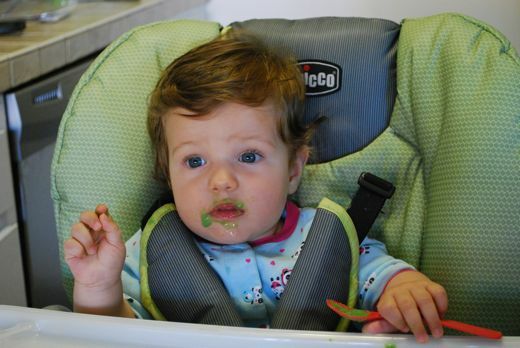 What other nut-free favorites do you include in lunches for your family members? The top photo was one I shot in partnership with Annie’s, featuring their Cheddar Bunnies and Pea B & J nut-free sandwich. However this post is not sponsored. 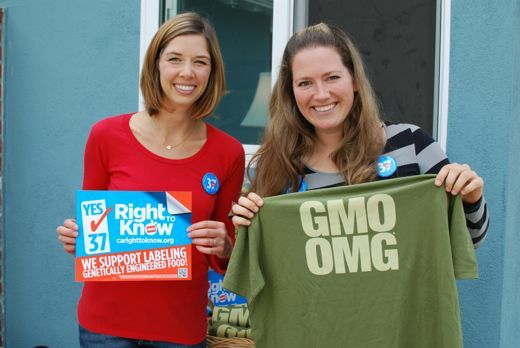 My kids and I really enjoy Sun Butter and sunflower seeds for nut-free school snacks. Me too. 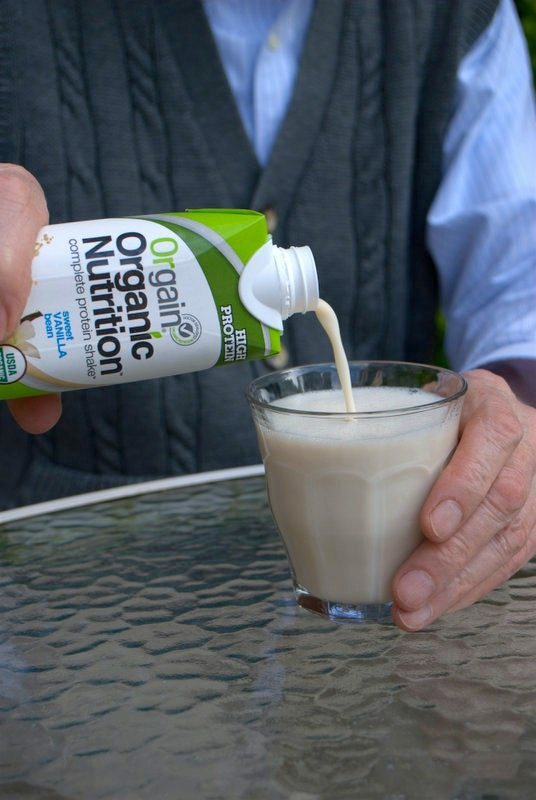 Such a great nut-free option! These ideas are so inspiring! Thank you so much!! I love the idea of small portions of different items. Can you tell me where you got the metal container? Hi Novita, This is a PlanetBox which is my favorite lunch container. It’s pricey, but a great longlasting investment. We’ve had ours for 4 years and it barely shows any wear. 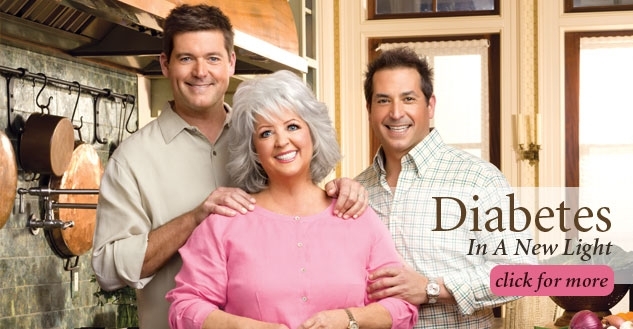 I can’t recommend it enough!